I know vampires and zombies are really beaten to death these days, but Guillermo Del Toro and Chuck Hogan’s The Strain has it where it counts. Because these subjects are now overdone, I read this book based on my appreciation for Guillermo’s great, imaginative film work. I also purposely did not read anything about this book beyond the description, because I did not want to come into it with any pre-conceived notions or judgments. 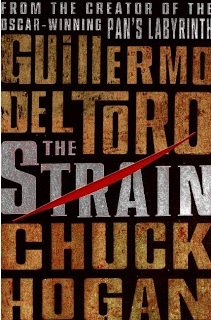 One word to describe The Strain: Engrossing. I usually read on my train commutes to and from work, as well as my lunch breaks, and during all of these times I would just automatically shut out the outside world because I was so into the book and the visual being described. Recently, the only books that can do this for me are Diana Gabaldon’s Outlander series. Bottom line: You’re an awesome writer if you can make someone forget the outside world and engross them completely into a fictional world. Plot wise, I really enjoyed the historical backstory to “The Master” vampire – which takes the reader to Nazi-run concentration camps and Post WWII Europe. I also appreciated the realistic handling of this supernatural turn of events. For example, one of the first vampires that gets loose walks around naked in Times Square – and, well, it’s Times Square in New York, so everyone just thinks it’s another crazy guy so other than being amused, they don’t act too concerned. Funnily enough, I feel this probably would happen were there a real zombie/vampire outbreak in a metropolitan area. I also appreciate that we’re getting most of the story told from Eph who works for the CDC – we know what’s going on at the root of the cause – rather than survivors on the run, wondering why the outbreak is happening. On the flip side, we also get the perspective of unsung heroes such as an exterminator and a young man right out of juvi. My only gripe with this book is the lack of female characters. There is Kelly, the ex-wife of Eph, who essentially is a damsel in distress. Then there is Nora, Eph’s co-worker who he’s had a fling with. I was hoping for Nora to come forth a bit more throughout the book, but she was merely a 2D fixture. She barely had any lines; she was just there most of the time, which was disappointing. However, I definitely want to read the next two books in the trilogy, so I’m hoping that Nora has a bigger role in The Fall and The Night Eternal. ← Read an excerpt from GRRM’s The Winds of Winter!